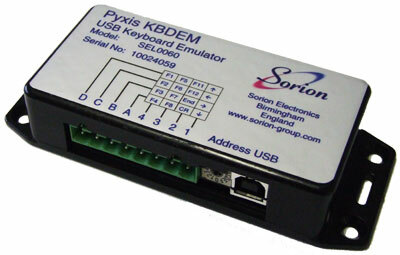 The Pyxis KBDEM is a USB keyboard interface specifically designed to allow the connection of industrial push-buttons to a PC, when the standard keyboard is not required, or most likely not wanted. The Pyxis KBDEM is ideal for integration into automotive & component test systems. The Pyxis KBDEM is a convenient means of replacing a standard PC keyboard with robust / industrial push-buttons. The Pyxis KBDEM is plugged into the PC USB port and provides emulation for a standard HID keyboard. Up to 16 external push-buttons can be utilised. The module scans the matrix of attached push-buttons and sends the associated key code for the button pressed. The Pyxis KBDEM is a USB powered device and takes its power from the PC. The optional Pyxis REMPB is a wireless remote push-button input that can work either in place of or in conjunction with the direct wired push-buttons. The Pyxis KBDEM is plug and play and can be plugged into the PC USB at any time. The unit is supplied with a USB cable for connection to the PC either in place of (or in conjunction with) the standard keyboard. There are no additional windows drivers required.